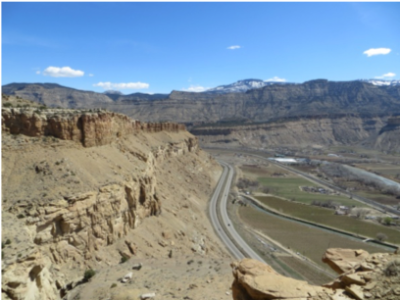 Palisade, located in the eastern end of the Grand Valley, was named for the austere and dramatic palisades–steep cliffs of Mancos Shale bordering the town. The sculptured appearance was formed by various geologic uplifts in the area combined with localized erosion and down cutting by the Colorado River. Mancos Shale is mudrock that accumulated in marine environments of the Cretaceous Inland Sea which retreated about 75 million years ago. The Mesa Verde geologic sands were stripped from the mountains and built up as beach sands and river beds. The Mesa Verde geologic formation is also known for its thick layers of coal. In Colorado, coal was formed in the middle Cretaceous Times (144-65 million years ago). In Palisade, the Mesa Verde formation provides abundant reserves of highly valuable low-sulfur bituminous coal. At the turn of the 20th century, coal mining was a big business and as important to Palisade’s early development as fruit growing. More than a dozen coal mines operated in the area. John Nichols opened the Cameo Mine in 1885 which later provided coal for the Public Service Company power plant built on the former Cameo town site in 1957. Most of the mines closed in the late 1950s when natural gas replaced coal for heating. 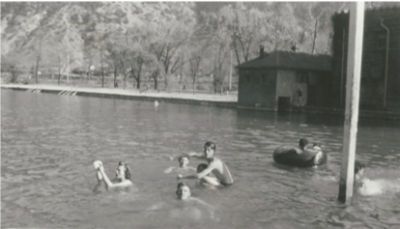 For well over 10,000 years, Native Americans used the abundant waters flowing in the Grand Valley. When the area officially opened to white settlement in 1882, pioneers not disappointed by the Valley’s desolate appearance saw potential–if water from what was then the Grand River could be captured through dams, diversions, and canals. The subsequent irrigation projects transformed the desert into one of the most productive agricultural regions in Colorado and the Intermountain West. By the mid 1880s, it was apparent Palisade’s unique geologic location protects crops from spring freezes. 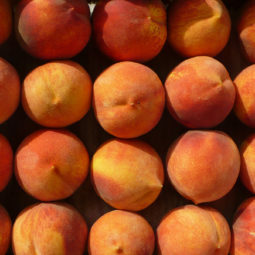 The local climate is often referred to as the “banana belt.” The mild climate and unique terrain create near-perfect peach growing conditions in the approximate 10-mile area stretching from the tip of Mt. Garfield to the south end of East Orchard Mesa. Wind moves 8 to 12 mph down-slope from the north and is focused by DeBeque Canyon. This “million dollar wind” is compressed and warms the air to prevent crop-killing frosts in the spring. As the katabatic wind moves west – down valley – it spreads out and its warming affect diminishes. In addition, the palisades absorb warmth and help prevent frost damage. The mild climate, a 182 day growing season, plenty of sunshine and water through elaborate irrigation systems, dams and canals, make Palisade the “Peach Capital.” Mineral-rich soil and our 4,700 foot altitude–which means warm days and cool nights–are also credited for Palisade’s great tasting peaches. Palisade makes Colorado the 7th largest peach producing state in the U.S. Though a winter kill in 1962-63 wiped out most of the existing fruit trees, and a severe winter in 1989 again damaged the fruit trees and wine grapes, our growers bounced back. 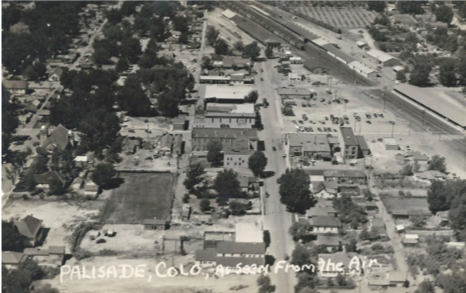 Palisade also largely survived pressure to convert prime irrigated land to high-density housing in response to a series of energy booms on the Western Slope. More recently, demand for locally-grown produce increased the number of fruit trees as well as expanded crops to include wine grapes, hops, and lavender. Palisade is a popular destination for fresh fruit, especially peaches, as well as 25 of Colorado’s 140 wineries. It is also the only wine grape growing region in the world more than 1,000 miles from an ocean and at 4,700 feet above sea level. The Ute Indians were forcibly removed from the Grand Valley in September 1881, though white settlers were probably living in the area and envisioned the potential of the rich agricultural area, once irrigation water was available. Early orchards were planted next to water sources. 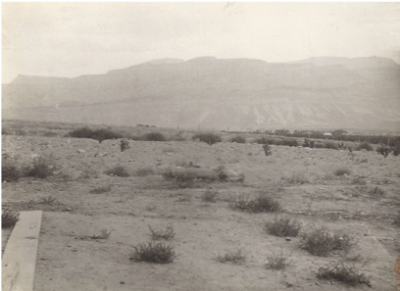 In the Palisade area, J.P. Harlow planted crops in Rapid Creek east of Palisade at the mouth of DeBeque Canyon. 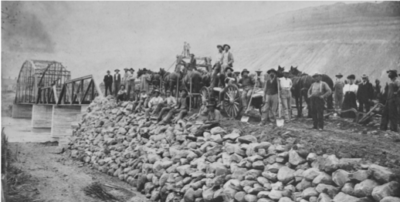 The earliest irrigation canal, the Grand Valley Canal, built in 1883, did not serve Palisade and the “Poverty Flats” area east of town, now known as Vineland. 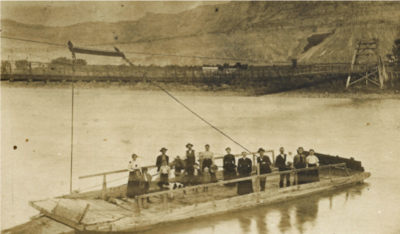 Consequently, water to Palisade orchards had to be hauled from the river in barrels with horse-drawn wagons. The other important economic driver in the Palisade area was coal mining from a dozen mines in two coal seams. The biggest deposit was in nearby Cameo–three miles east of Palisade–in DeBeque Canyon. Pioneers were intrigued by what irrigation could mean for a desolate, sagebrush desert in the 1880s. The first canal, the Grand Valley Canal, did not serve the rich agricultural land around Palisade. Palisade’s first hotel, the Purdy Hotel, was built in 1882 or 1884 by Samuel L. Purdy, a gifted stone mason. Purdy Mesa near Whitewater, is named for him. 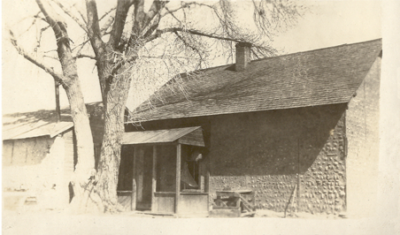 An adobe house near the River and Grand Valley Canal headgate was considered to be the oldest structure in Palisade. It may have served as a trading post. Kate Harlow at her restaurant and store in Grand Junction. Kate’s husband, John Petal Harlow, is credited for planting the Valley’s first fruit trees and successfully raising fruits and vegetables on his Rapid Creek ranch. He also developed irrigation canals, and operated what later became the Farmer’s Riverside coal mine across the river from his ranch. 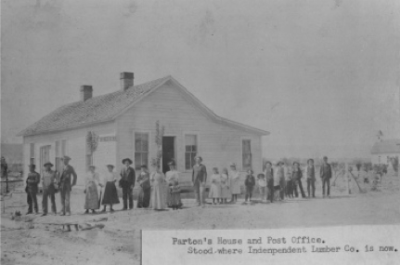 The Harlows had a restaurant and other business interests in Grand Junction as well. “Judge” Harlow, as he was known from his position as one of Mesa County’s first Justices of the Peace, passed away in March 1891. His gravesite on his Rapid Creek Ranch was added to the list of State Register of historic sites in 1995. 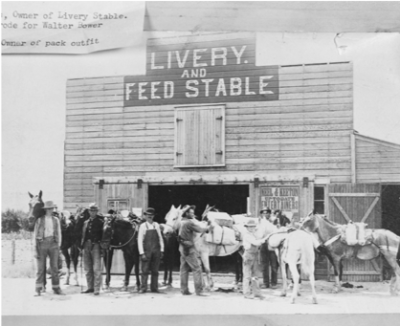 Before the railroad came through Palisade in 1890, travel was by horseback and stagecoach. First settler, J.P. Harlow, establishes farm and orchards, diverting water from Rapid Creek into the Grape Vine Ditch. By 1888, he harvests over a ton of peaches from his Rapid Creek Orchard. Grand Valley Canal south of Palisade provides irrigation water to much of the Grand Valley, but does not serve the rich agricultural land around Palisade. Coal mining begins when George Smith establishes Book Cliff coal mine north of Grand Junction. George Smith opens Cameo Coal Mine. Roan Creek toll road completed. 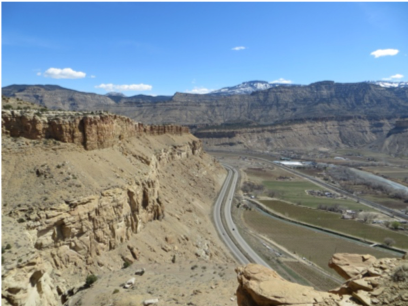 It provides passage through the Hogback (now DeBeque Canyon) to Palisade and the rest of the Grand Valley. J.P. Harlow also diverts water from Rapid Creek into the Crawford Ditch. Col. C.C. Bower diverts water for irrigation from Grand River in Poverty Flats (Vineland). 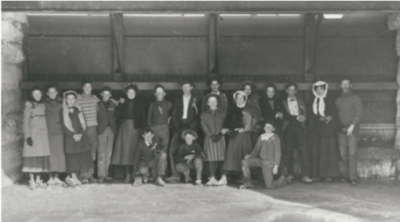 A standard gauge railroad extends from New Castle and opens new markets for Palisade’s coal and fruit business outside the Grand Valley. The Rio Grande Junction Railway was a joint venture between the Colorado Midland and the Denver & Rio Grande Railways which jointly operate the railway from Rifle to Grand Junction. Mary Currie files a patent for 133 acres of land at the center of Palisade in 1891, but probably occupied it earlier. Currie sold lots to Frank M. Burger in October 1891 who then sold them to Grand Junction banker and developer Benton Canon six months later for more than twice the $1,500 he paid for the two lots. Canon filed the original plat for the town between First and Fifth streets, and Main Street and Peach Avenue. In 1889, Currie sold a strip of land for a total of 6.3 acres to the Denver and Rio Grande and the Colorado Midland Railroad for the railway right of way. W.A. Pease is considered the first settler in what was called Palisades. Canon also plats the Palisade Fruit Tracts which have 12 lots varying from one to 13 acres covering the area from First to Eighth streets and from Peach Avenue west to Elberta Avenue. The area from Fifth to Eight and from Main St. to Peach Ave. are known as Fruit Tracts. 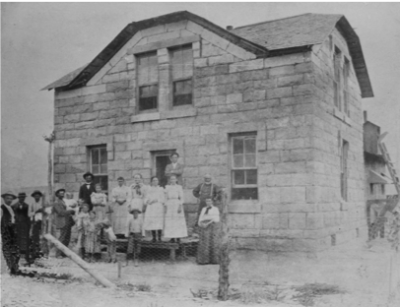 The first one-room school opens in 1893 on Second St. 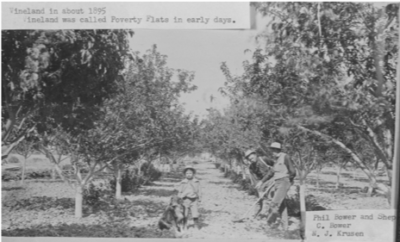 Early orchards were also planted in the Vinelands, then known as “Poverty Flats.” Colonel Christopher Columbus Bower center, with his son, Phil, and dog, Shep. N.J. Krusen is on the far right. Colonel Bower was one of the original incorporators of the town of Palisade and elected as a member of the Board of Trustees. 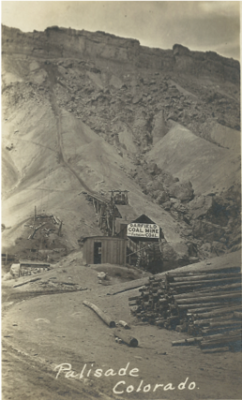 Coal Mining was important to Palisade’s early economy. More than a dozen coal mines operated near Palisade over the years. 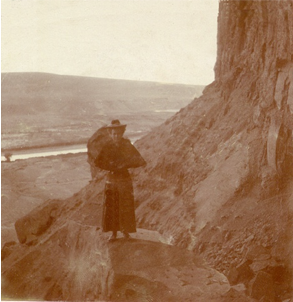 Mae Purdy hikes on the stage coach trail near the palisades in the 1890s. The trail was built to get mining equipment to the Mt. Lincoln coal mines. It was never used by stagecoaches. 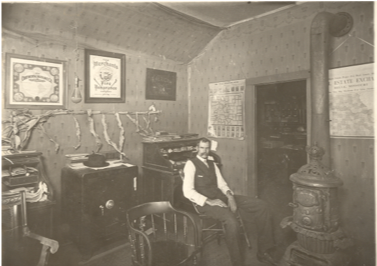 Judge Hoke in his office in what was previously the first one-room school built in 1893. 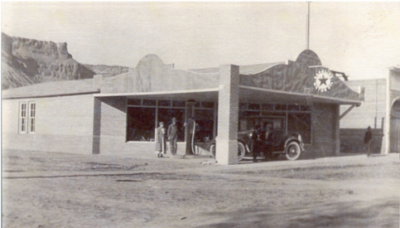 It was the location of the Palisade Public Library until 1952. 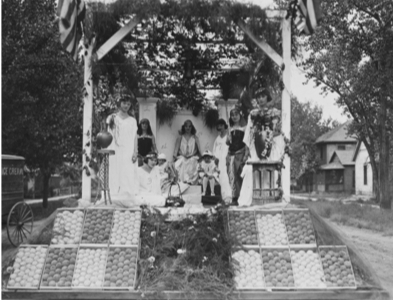 John L. Oliver was one of the first Palisade fruit growers. His orchards, planted before irrigation ditches were built, require water to be hauled from the river in barrels on horse-driven carts from first sun light until dusk. Frozen water in the bottom of the irrigation canals provides options for ice skating. This group is posing at the Grand Valley Canal headgate. Palisade’s first depot is located on the south side of the tracks near Kluge Avenue. It was then moved to the north side of the tracks and used as a residence. 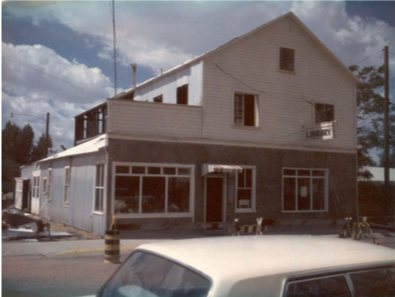 It became the United Fruit Growers’ Association offices for many years, and is now part of Peach Street Distillery. Denver & Rio Grande and Midland jointly operated Rio Grande Junction railroad extends from New Castle to Palisade. Frank Burger begins Mt. Lincoln Ditch – later becomes Price Ditch – completed in 1909. Post Office at Harlow (Rapid Creek) opens May 17. 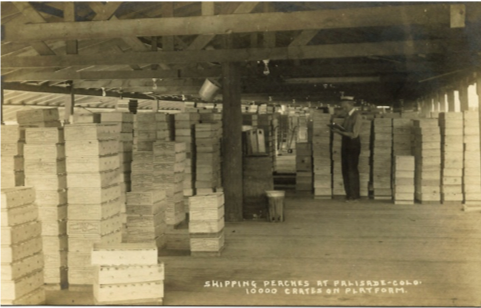 Palisades Post Office opens, with W. A. Pease as Postmaster, on April 7. First school opens on 2nd Street. Highline Mutual Irrigation District incorporates; purchases Mt. Lincoln Ditch. Smith and Struthers Ditch begins piping water from Plateau Creek – abandoned in 1905. Benton Canon plats the Town of Palisade. Cable ferry from east 4th Street to the Vinelands begins operation. State Bridge is completed over the Grand River at the “narrows” east of Palisade near Rapid Creek. Blue Flame Mine on Rapid Creek opened by Mr. Brownfield. In 1903, Marion O. Delaplain and others, including the trustees of the Methodist Episcopal Church, plat the area east of Main Street from the railroad south to opposite 5th Street as the Delaplain Addition. These are small lots with 25 to 30 feet of frontage. Palisade incorporates as a town in 1904, changing the name from Palisades. 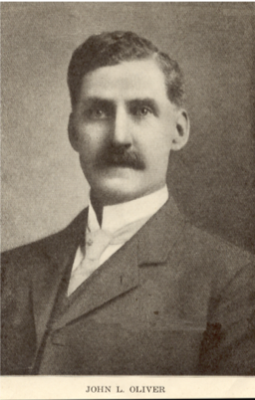 The first municipal election is May 2, 1904, and Herman Kluge is elected Mayor. 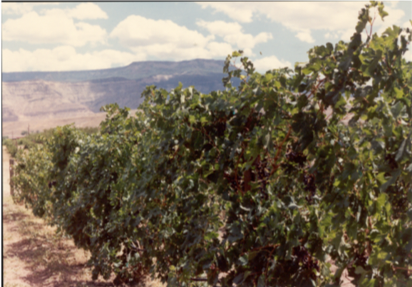 Prohibition comes early to Palisade in 1908, though wine grapes, grown primarily for personal–not commercial use–especially in Rapid Creek and the Vineland, succumb to a disease. Several churches begin and erect buildings, including the 7th Day Adventist, Christian, Presbyterian, Baptist, and Methodist Episcopal Churches which still stand. 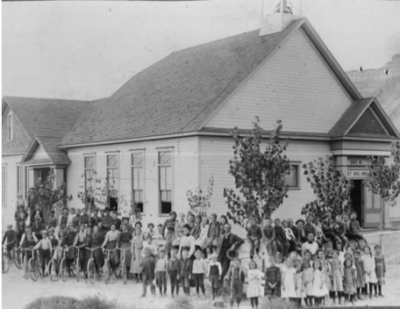 A new, bigger school is built on Kluge Ave. and 4th St. in 1900. The first graduation is in 1905. A number of irrigation projects are built, and some fail to provide adequate irrigation water to serve the increasing number of orchards. Many buildings in downtown Palisade are built in the early 1900s. Palisade has electricity and telephones by 1906. 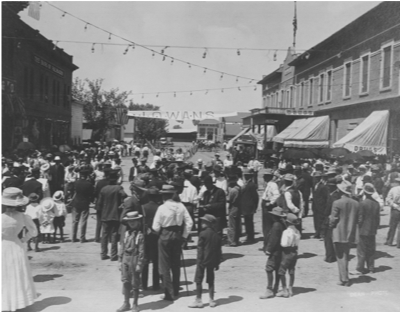 This is the east side of Main Street in 1905 with Palisade families riding in Winton, Buick, and Reo automobiles. Rev. 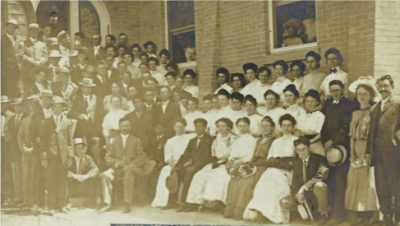 Vermillion’s Class of the Methodist Episcopal Sunday School in 1908. The M.E. Church, built in 1907 at a cost of just over $14,300, is considered to be “one of the most modern and commodious churches formed on the Western Slope.” Colorado Governor Henry A. Buchtel delivers the dedication sermon. Palisade’s second school, located on Kluge Ave., opens in August 1900. Palisade was School District 19. M. Landreth; Dr. G.R. Brown; Clint H. Martin, Clerk; Mayor Herman Kluge; W.A. Powell; George W. Sawade; John A. Pierson; and William E. Bell. 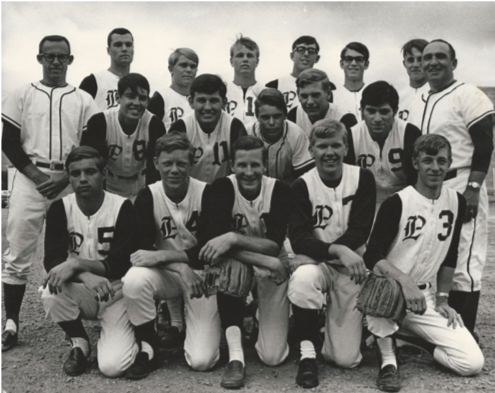 Baseball has long been a passion in Palisade. 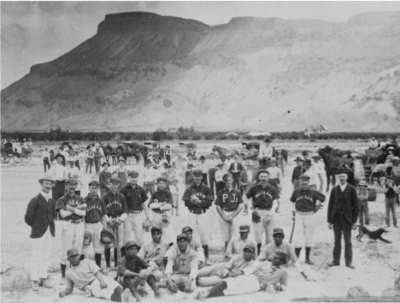 This 1902 photo is the Palisade team playing the team from the Teller Institute whose students were primarily Ute Indians, though other Native American tribal affiliations were represented. To make crossing the river easier, a ferry is built to connect 4th St. with the Vineland area. A suspension bridge is soon added, and both are replaced by a steel bridge in 1909. School on 4th St. and Kluge Ave. opens in August, replacing 1893 school building on 2nd St.
Benton Canon sells second opening of Blue Flame mine – called Palisade Mine. George Smith opens mine which is named Riverside Farmer’s Mine in 1905. George W. Bowman patents the “fruit gathering bag” December 4. Fred DeRush opens Midwest Mine – first called Grand View Mine. Reclamation Act withdraws land in proposed route for the Government Highline Canal from development. Highline Mutual Irrigation Co. authorizes construction of Stub Ditch. Palisade Tribune begins publishing on June 6. It replaces the short-lived Palisade Courier. Town of Palisade incorporates April 4 (previously called Palisades). George Smith begins Garfield Mine. Mt. Lincoln power house and canal damaged in spring run off. Palisade Irrigation District (PID) forms. Palisade Fruit Growers Association organizes. Palisade Fruit Growers Association builds Valley’s first cannery. First Chamber of Commerce meets on December 15. (Later, it becomes the Palisade Business Men’s Association.) 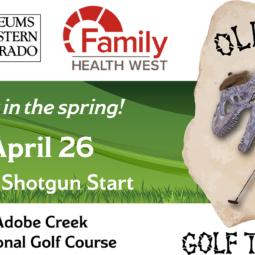 The $1 initiation fee draws 50 members. Palisades National Bank is established and located in the Purcell Building on Main. Orchard Mesa Irrigation District (OMID) formed by T.C. Henry. Royalty payments from Garfield Mine increase from $.50/ton to $1/ton in August. First “Iowa Day” held in Palisade to celebrate large number of settlers from Iowa. Palisades National Bank builds a new building on the corner of 3rd and Main Streets. Grand Junction Fruit Growers’ Association builds platform and offices in Palisade. Palisades second depot finally opens in November. Completed irrigation projects, including the long-anticipated Government High Line Canal and Grand River Diversion Dam, ensure adequate water for increasing agricultural production, in spite of spring frosts and economic troubles. 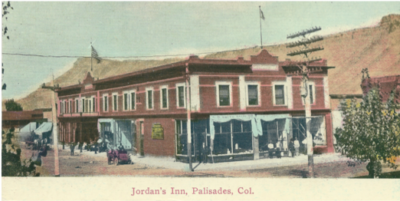 A new high school opens in 1910, and a fire destroys the iconic Jordan’s Inn in downtown Palisade in 1915. Horse drawn carriages and blacksmith shops give way to garages to serve gasoline-driven engines. Palisade enhances its community identity with successful Iowa Day and Palisade Day celebrations. People from the midwest are still drawn to the area by financially successful fruit growing opportunities. 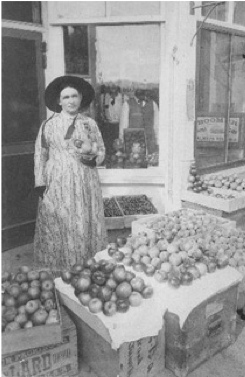 Entrepreneurs patent a number of items, including the fruit gathering bag in 1900, orchard heaters, a metal wheel, and use stilts to prune limbs from tall fruit trees. Many young men joined the military in World War I, as coal production increased and the profitable fruit industry continue to attract residents. 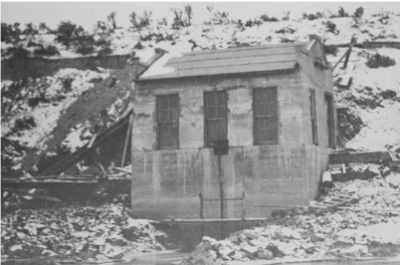 The Orchard Mesa dam, power canal, and pumping plant are completed in 1910. The Grand River Diversion Dam is dedicated in 1915 and the Government Highline Canal is completed in 1917. Jordan’s Inn, a two story hotel with commercial space on the ground level was built in 1907 and burns to the ground in November 1915. 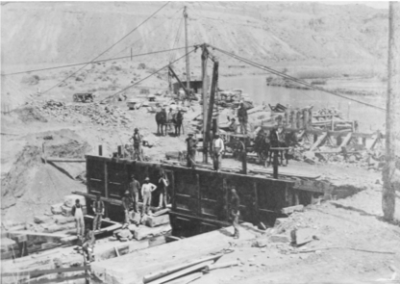 Workers put a large metal roller in place at the Grand River Diversion Dam, or “Roller Dam,” in DeBeque Canyon in March 1915. Hundreds of workers, locals and foreigners, are needed for the massive irrigation projects from 1910-1920. Many are housed in tents and temporary facilities near Cameo. Many early Palisade settlers are from Iowa. 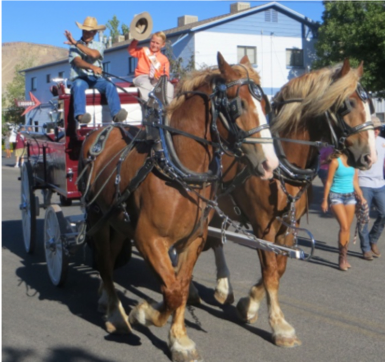 The first and most successful Valley-wide celebrations to honor their home state are held in Palisade. The 1910 Palisade High School is Palisade’s third school and the tallest building in town. A spiral-slide fire escape is added in later years for safety of students and teachers in classes held on the top floor. The building is torn down in 1970. 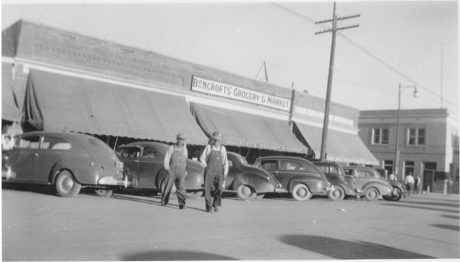 Cicero G. Smith is a fruit grower and an inventor. This car is equipped with his patented Universal Spring wheels. He is in the front seat and John Port is at the wheel. Rear seat left is E.W. Jordan, G.W. Bowman, and Senator Herman Kluge. Standing next to the car is W. S. Furman. This bridge replaced the ferry and suspension bridge. Orchard Mesa Irrigation District (OMID) dam in DeBeque Canyon, power canal, and pumping plant completed. South Palisade Heights Irrigation pumping plant constructed just west of the OMID plant. New Palisade school opens on 8th and Peach Streets for grades 1-12. 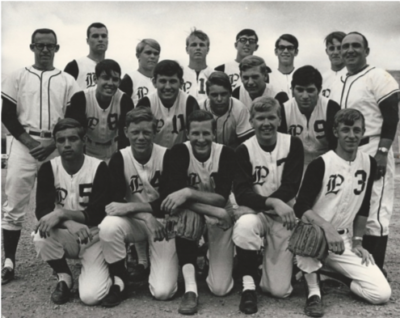 Town’s baseball team was the Peach Pickers. New directors elected at the Palisades National Bank include George W. Bowman, John J. Bridges, O.H. Shoup, H.G. Crissey, F.R. Davis, V.C. Talbert, and H.W. Kluge. John Otto stops working on the Palisade Trails and Sunbeam Trail on the palisades after making the Ute Trail near the Garfield Mine accessible for horses. He returns to Monument Park south of Grand Junction to ensure it becomes a National Monument. Construction begins on Tunnel No. 1 for Government Highline Canal. Official groundbreaking held September 19. Government High Line Canal Tunnel #2 holed through December 27. Midwest Coal mine sold to Chris Hoppel of DeBeque and renamed Red Arrow Mine. Aerial tramway built for Garfield Mine on the palisades north and west of Palisade. Grand River Diversion Dam completed. Congressional Dedication with members of the Appropriations Committee as water flows in the Government High Line Canal on June 29. It is a German, roller-crest design and the largest such “roller dam” in the world. Grand Valley Drainage District forms to deal with excess water from orchards and fields which goes underground and hinders crop production. PUC reduces fuel tariffs on shipments of coal to Eastern Colorado. Jordan’s Inn, hotel with commercial space burns to the ground November 19. (Most of lot at 3rd and Main Streets remains vacant until 1962). Bureau of Reclamation study determines siphon location for OMID to be included in the Grand Valley Project. Palisade Volunteer Fire Department forms. Price-Stub pumping plant abandoned. In exchange for earlier water rights, water to canals delivered is supplied by the Government Highline Canal from the Grand River Diversion Dam. 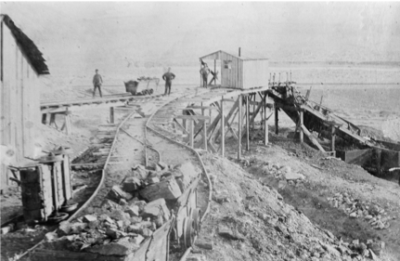 Midwest/Red Arrow Coal Mine makes river crossing in Vineland to get coal ore to railroad. Coal miner strikes elsewhere stimulate production in Mesa County. First Palisade Day celebration July 4. 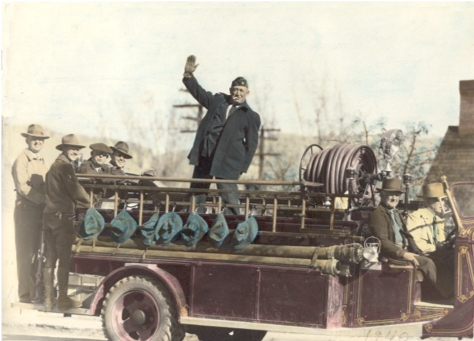 In later years, it features a water fight between the Palisade and East Orchard Mesa Fire Departments. The original vision of land use by Benton Canon with his Fruit Tracts of five to ten-acre orchards within the town is changed by developers who subdivide into house-sized lots. All but the western tier of the Fruit Tracts are subdivided by the time the 1926 Sanborn map is drawn. Fruit Tracts become the Hottes, Hampton, Jordan, Landreth, W.E. Bell, Mott, Nelson, Blackstone, Mt. Lincoln, and Peach Grower’s Additions. 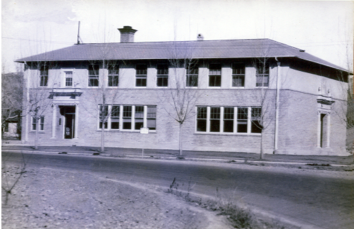 A new high school opens in 1925, leaving the 1910 building for elementary and junior high school students. A number of fruit growers, unhappy with the owners of marketing cooperatives, form a new, member-owned United Fruit Growers’ Association in 1923. The codling moth, which devastates apple orchards in Clifton and Fruita, does not infect peaches. Palisade’s fruit orchards mostly survive. 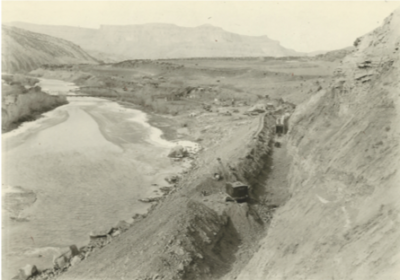 The Government Highline Canal begins supplying water to Orchard Mesa through a siphon under the newly renamed Colorado River. The siphon is completed in 1923, and the original OMID dam and power canal upstream is abandoned. 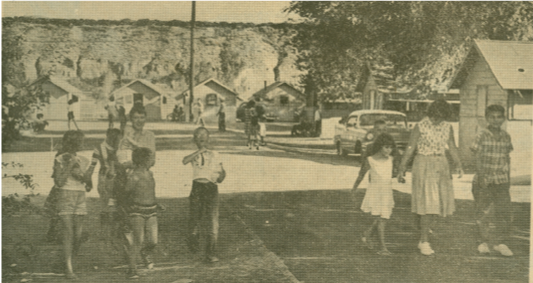 Coal mining continues to be important to Palisade’s economy until the late 1950s. Many of the dozen mines around Palisade are smaller “wagon” mines. Owners and miners work in the orchards in the summer and mine in the winter when more coal is needed. The nearby coal mining town of Cameo, east of Palisade, is closely connected to Palisade through employment and the schools. Attendants seated from left: Mary Edith McKay; Dorothy Echternach; Dorothy Nuckolls. 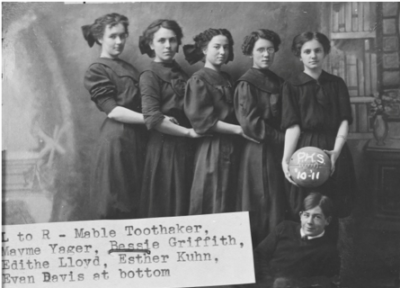 Standing left to right: Helen Swisher; Mary Mosier; Ruth Wolfe; Jo Schneible; Agnes Eyer. 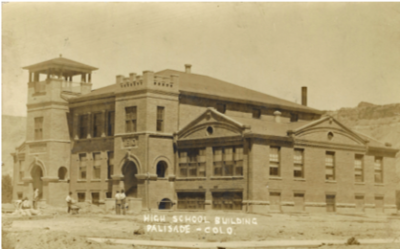 A new Palisade High School is built in 1925 to accommodate the growing number of students. The gymnasium, band room, and stage are added as a WPA project in the Great Depression. 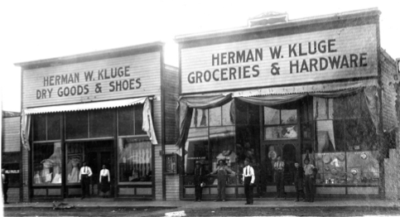 Herman Kluge, Palisade’s first mayor, operated a general store on the west side of Main St. He was elected to the State Senate in 1914 after serving as a Mesa County Commissioner. Kluge was chairman of the State Banking Committee and also a member of the Temperance and Horticulture committees. Grand Mesa was always a popular destination for fishing, hunting, and camping. 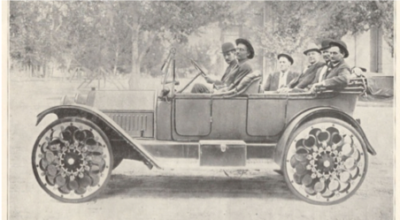 As gasoline-driven automobiles flourish, E.G. Bennett moves his former bicycle shop on Main Street into a garage and service station he builds on the corner of 3rd St. and Kluge Ave.
Work begins on Orchard Mesa Irrigation District (OMID) siphon under river in DeBeque Canyon near Rapid Creek to supply water from the Government Highline Canal to the Orchard Mesa power canal. Grand River renamed Colorado River. Member-owned United Fruit Growers’ Association forms. Property tax mill levy adopted to pay for Grand Valley Drainage District’s operations. Orchard Mesa Irrigation District siphon under the Colorado River completed. Explosion kills manager R T. Scott and five others in Midwest/Red Arrow Coal Mine on October 10. Mt. Lincoln High School, located west of Palisade near G and 36 Roads closes. Post office robbed and bandits suspected of hiding in the Old Palisade Mine. Palisade High School opens in the lot west of the 1910 Palisade School on the Highway. Wilfred Earl “Jerry” Scott and Milton Thomas electrocuted in Midwest/Red Arrow mine accident on September 7. Orchard Mesa Irrigation District delivers water to 10,000 acres. Palisade Chamber holds first Annual Awards Dinner. 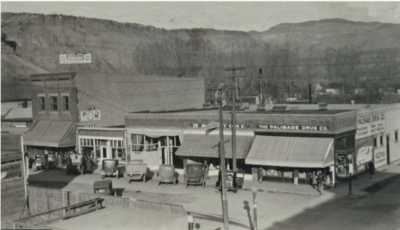 While the Depression affects Palisade’s economy–including a forced shut down of the Palisades National Bank by the bank moratorium in March 1933–the area’s agricultural economic base help the Grand Valley avoid dire situations experienced in cities. Civilian Conservation Corps Camp BR 59-C is established in Riverbend Park south of Palisade in 1935. 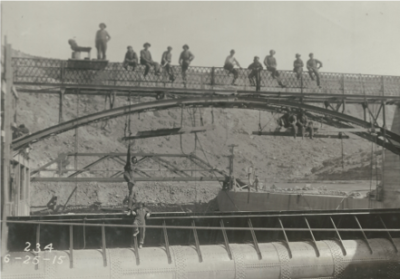 Supervised by the Bureau of Reclamation, CCC workers line canals with concrete and build walls at the Orchard Mesa Irrigation District plant and Grand River Diversion Dam among other projects. 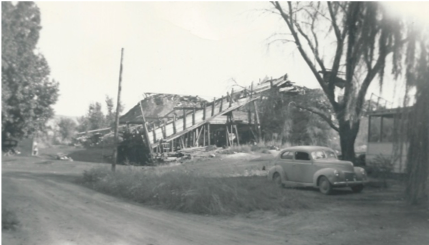 WPA projects include building roads and bridges to the east of town. Dust bowl migrations help provide a source of migrant workers for peach harvests. The Peach Mosaic virus destroys over 100,000 trees. Marketing cooperatives are successful in building demand for Palisade’s fruit, especially peaches. Courtesy of Hugh Coachman, Jr. The east side of Palisade’s Main Street in the early 1930s. The large lot where the Jordan’s Inn was located on the southwest corner is still vacant and strewn with broken glass. 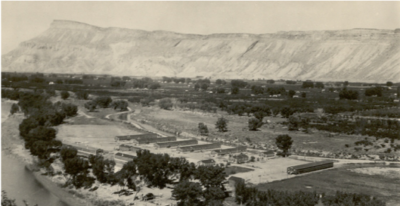 Civilian Conservation Corps Camp BR 59-C is built south of Palisade in 1935. It houses 200 men who work on Bureau of Reclamation projects until World War II. Some of the buildings are moved to Vega Dam in 1958. 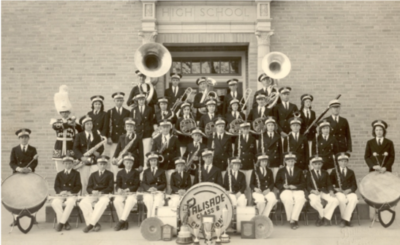 The 1934 Palisade High School band wins the Class B band competition. Director was Cleon Dalby. 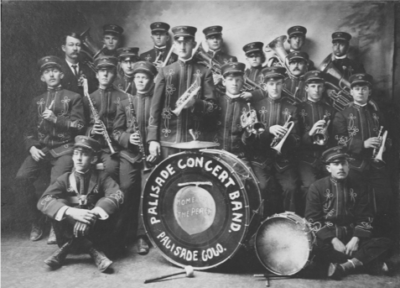 Palisade has a number of award-winning high school bands over the years. 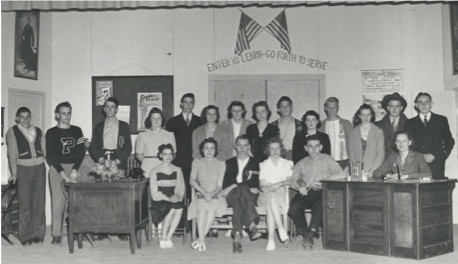 School activities are an important part of the Palisade community. 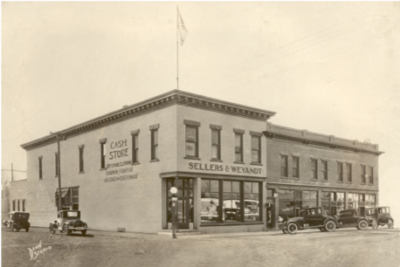 This building was built in 1903 by John Secor and J.J. Hampton as the Palisade Mercantile. J.W. Hugus purchases it as one of his chain of stores on the Western Slope and in Wyoming. There are subsequent owners and retail stores at the location, but the building is still known as the Hugus Building. Hunting and fishing are popular activities by Palisade residents for both food and recreation. 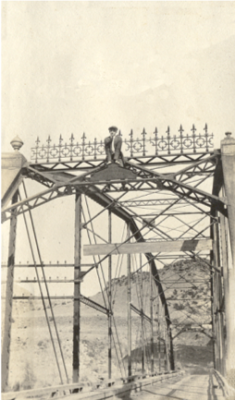 Chester Eyer on the top of the first State Bridge east of Palisade near Rapid Creek. The State Bridge is built in 1909 near the “narrows” where horses and wagons previously crossed the Grand River. This bridge is replaced in 1939 by a new one just a few feet upstream. Gearhart Coal Mine, located on the palisades west of Palisade, opens. Orchard Mesa Irrigation District begins building a hydroelectric power plant. The Road through DeBeque Canyon from Plateau Creek to DeBeque is completed. Orchard Mesa Irrigation finishes a hydroelectric power plant next to its pumping plant on 38 Road at the bottom of Orchard Mesa hill. Civilian Conservation Corp. Camp BR-59-C built along River south of Palisade for unemployed Depression-era men working on Bureau of Reclamation projects, including cleaning and lining irrigation canals with concrete. New “State Bridge” completed near the former bridge across from Rapid Creek east of Palisade. 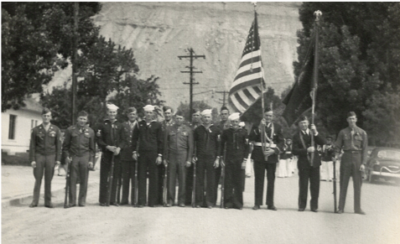 World War II affects Palisade, as other communities. Getting adequate help for peach harvest is always a challenge, but having previous workers away fighting the war made Palisade’s labor situation more difficult. 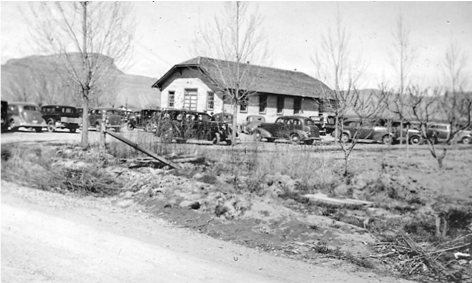 A migrant labor camp is built near the River south of Palisade to house workers and their families. In the harvests of 1944 and 1945, German prisoners of war are housed in the former CCC Camp barracks in Riverbend Park. Additional sources of workers include Japanese internment camp members and Italian prisoners of war. A migrant labor camp with 200 cabins is built in 1941. The Peach Board of Control later operates the camp to better house workers and their families, and provide basic services. The camp is closed by the Federal Government in 1961, forcing growers and workers to find other housing. Aerial photo of Palisade during harvest 1945, taken from above 3rd street looking west towards the Mountain Lion building and United Fruit Growers’ Association loading platforms. Plays performed by Palisade High School’s award- winning drama and speech students are always popular. This is the 1941 Senior Class Play. 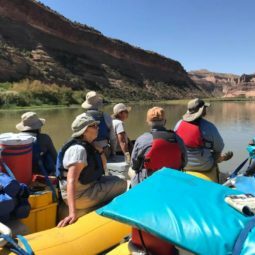 A time-honored Palisade High School tradition is an organized trip for the senior class to “sneak” off to Glenwood Springs, assisted by teachers and school officials. In 1941, the sneak day is in October. 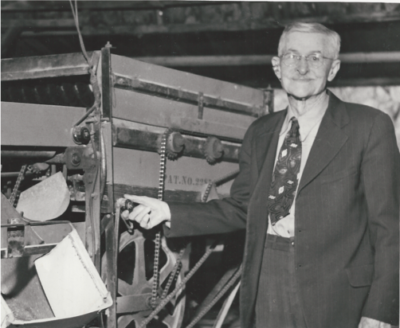 Billy Edwards with his hand on an Edwards Grader which he invents with the help of his financial partner, Raymond Peeples. The grader has a mechanical device to remove fuzz from Standard Elberta peaches and sort fruit by size for faster and easier processing. 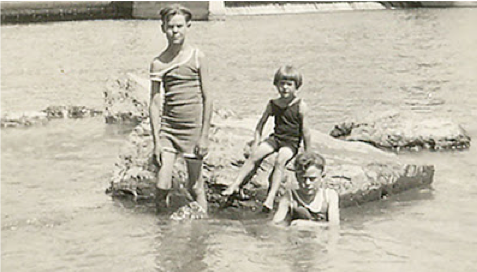 Archie, Dorothy, and John Carver swimming in the Colorado River near the Roller Dam. Palisade kids learned to swim in irrigation canals and the more dangerous and challenging River. Trucks with packed boxes of peaches line up at the United Fruit Growers’ Platform. The boxes are moved to the platform where the fruit is inspected, and then the boxes are loaded into refrigerated box cars for shipment by the Denver & Rio Grande Western railroad to markets, primarily in the Midwest. Significant damage to Government Highline Canal Tunnel #3 discovered and repair is postponed. Midwest Coal Mine in the Vinelands east of Palisade closed by Walter Scott, last operator. Over 1,000 people quarter for harvest in new 200-cabin Migrant Labor Camp west of the former CCC Camp in Riverbend Park south and west of Palisade. The Rio Grande Junction Railway merges into the Denver & Rio Grande Western (D&RGW). New bridge on 8th Street changes State Hwy. 6 route so it no longer goes through downtown Palisade on Iowa Ave. and Third St.
Palisade’s Wayne N. Aspinall elected as U.S. Congressman from 4th District. He is re-elected and serves 12 terms until 1973. He heads the Interior and Insular Affairs Committee which builds dams for flood control and recreation in the West. Though agriculture remains strong, significant changes to Palisade’s business economy occur as coal mines shut down, the movie theater closes, and abundant cars allow residents to shop in Grand Junction stores. 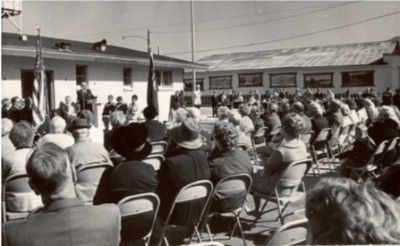 To handle an increasing number of students, a new elementary school opens in March 1958. The former 1910 school building becomes the junior high school with a few overflow high school classes. 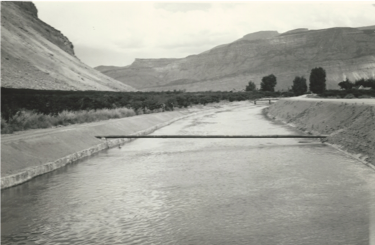 The Government Highline Canal supplies water to five canals in the Grand Valley, from Palisade, the Vinelands, and East Orchard Mesa all the way to Loma. Tunnel #3 collapses in March 1950. Palisade’s Congressman Wayne Aspinall musters federal aid to rebuild the tunnel before orchards are destroyed from lack of water. Most of the small coal mines close in the 1950s as demand for coal decreases with the introduction of natural gas to heat homes. 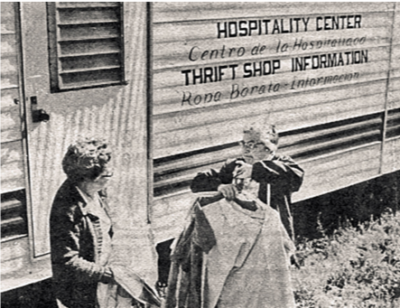 Child and Migrant Services begins in 1954 by Margaret Talbott, Vera Foss, and other fruit grower wives to help improve living conditions of migrant workers who come seasonally to help with peach harvest by providing food, clothing, and medical services. At first, the hospitality center, thrift shop, and headquarters are located in a trailer. 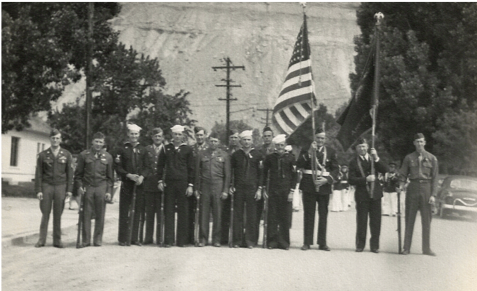 Palisade’s active VFW provides color guards for Palisade’s many parades. 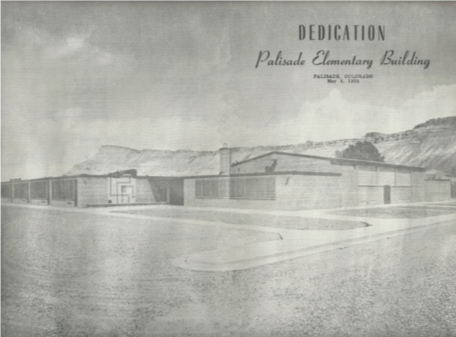 New Palisade Elementary school on Brentwood Drive is dedicated in May 1958 though students had attended classes in the building since March. The name was changed to Taylor Elementary after long-time educator and principal, Avon E. Taylor. Wayne N. Aspinall grew up in Palisade. He was first elected to the U.S. Congress 4th District in 1949 after serving as a lawyer, educator, and Palisade town board member. He served in the Colorado House of Representatives, including as Speaker of the House in 1937 and 1938. 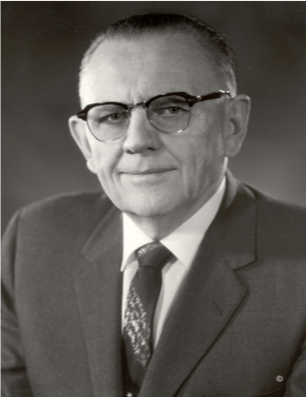 He was also a Colorado State Senator from 1939-1949. His legacy includes Chairing the House Committee on Interior and Insular Affairs from 1959 until 1972. 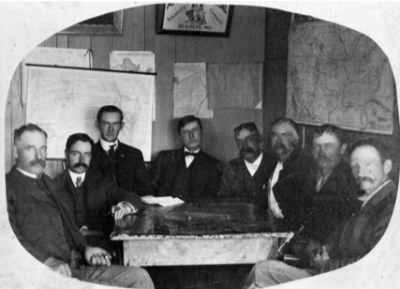 The Committee oversaw construction of major water storage and recreation projects in the West. His mark on water conservation in the West, our national parks, and resources, is unmatched. Stock car racing begins at the Grand Speedway in Grand Junction in 1951. 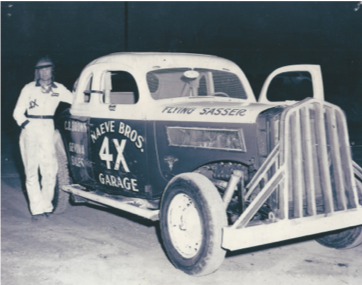 Palisade’s Naeve Bros. Garage’s driver, Ernie Sasser, wins lap races in 1954 and 1955. He sets the 22.30 second track record for the 1/4 track in 1955. Interstate 70 road and bridge construction begins at the bottom of the palisades. Exit 42 is a new, visible entrance to Palisade. 450 feet of Highline Canal Tunnel #3 collapse March 8. Palisade’s U.S. Congressman Wayne N. Aspinall mobilizes federal assistance to repair it and save fruit orchards. Repairs completed May 4. Idle cannery located on Bower Ave. and the railroad tracks burns to the ground in August. Palisade Coal Mine closes. It was the third largest producing coal mine in the area. Palisade School District consolidates with Mesa County schools. Palisade Library relocates from former school/Judge Hoke’s office on 2nd street to Bower Garage on 3rd Street. Rena Mary Taylor elected to the Colorado State Legislator. She serves five terms until 1962. Child & Migrant Services is established to bring community services to migrant and seasonal farm workers and their families in Mesa County. Cameo Power Plant opens, and generates electricity using coal fired steam. The nearby Cameo coal mine initially supplies coal to the plant. Late 1950s – Elberta Movie Theater on 3rd St. closes. Late 1950s – Public Service Company makes natural gas available for home heating, reducing the need for local coal producers. Palisade homeowners begin converting furnaces from coal to natural gas, and the need for locally mined coal is significantly reduced. Palisade Elementary school opens on Brentwood Drive (Renamed Taylor Elementary in 1960 to honor long-time principal, Avon E. Taylor). Bill’s Market opens in former Bancroft Grocery location in the Purcell building on Main St.
CCC buildings moved by the Bureau of Reclamation to Vega Dam in May. Cameo Post Office and Cameo Mercantile close in March. Palisade’s Celeste Lavonne Brown named National Peach Council Queen. Palisade growers host the Western Colorado Horticultural Society Convention and National Peach Council Convention in February. A new post office and municipal building successfully transform the physical appearance of downtown Palisade. They are made possible in large part by the Palisade Women’s Club and Palisade Library Board. The main grocery store moves to a new building in the former vacant lot at the corner of Third and Main Streets. The rest of the former Jordan’s Inn space becomes a municipal parking lot. 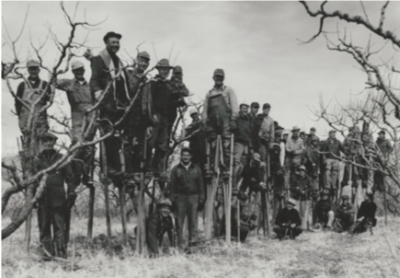 A devastating winter kill in 1962-63 dramatically damages trees and reduces the peach crop. By the late 1960s, peach production is a fraction of what it had been in the 1950s. Growers continue to use stilts as a way of pruning tall trees in the winter. Palisades’ E. T. Schneller is credited with the idea for stilts as early as 1937. The Purcell building and Palisades National Bank building on the east side of Main Street at Third Street in downtown Palisade in the early 1960s. The previous location of the Jordan’s Inn and other buildings on the west side of the street becomes a parking lot. The Palisade Women’s Club successfully lobbies for a new post office building to replace the outgrown space in the Purcell building where it had been for 50 years. 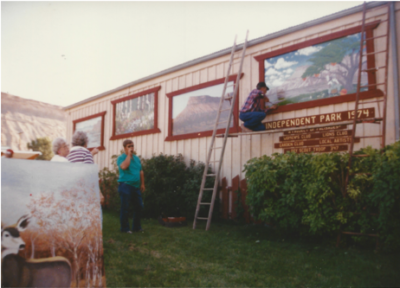 They also enlist local artists to create large paintings to decorate the Independent Lumber building’s plain wall across Kluge Ave. from the Post Office. 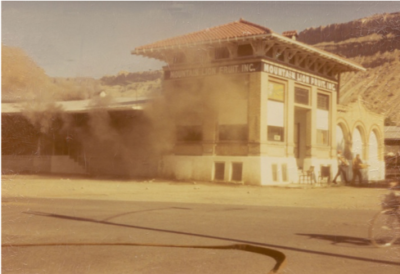 With a grant from the State Library Board, the Town demolishes the former Bower Garage building which housed the Palisade Public Library since 1952. In its place, a Municipal Building–which includes Town offices, the library, a jail and court room–is completed in 1968. 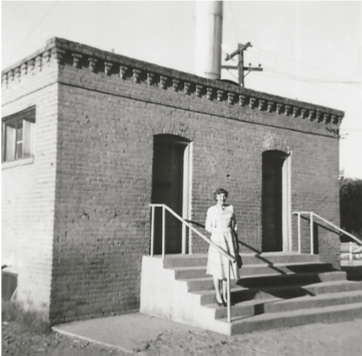 A woman on the steps of the building near the 1910 School building which houses the bathrooms and boiler room. Palisade Junior High School and some high school classes are held in the 1910 school building in the 1960s and 1970s. 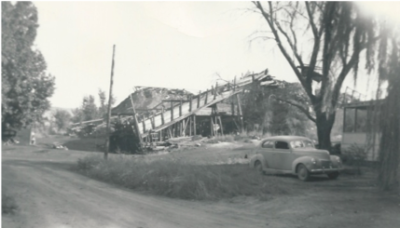 The 1910 school is demolished in December 1970. 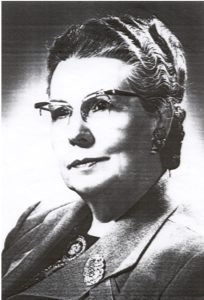 Rena Mary Taylor served as a State Legislator from 1950 until 1962, serving in both the Colorado House of Representatives and Senate. 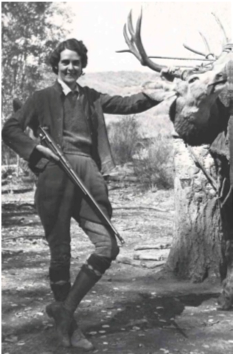 Among other accomplishments, in 1957, she introduced a bill to abolish the death penalty. It got out of committee, but died on the House floor. 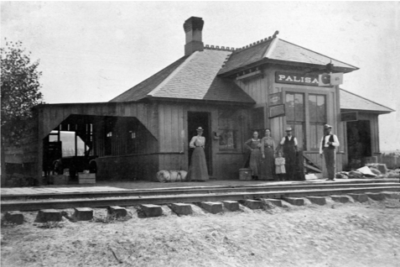 The second, much larger Palisade depot opened in 1909. It was located on 2nd Street between Bower Ave. and Main St.
By the late 1960s, trains no longer stop in Palisade. Three passenger trains a day as well as freight trains once stopped at this depot. Downtown Palisade streets and alleys are paved. Migrant Labor camp shuts down due to Federal regulations; growers forced to make alternate arrangements for seasonal workers. Bill’s AG Market moves to a new building across Main St. from the former Bancroft Grocery store location on the east side in the Purcell Building. Severe temperature changes in a few hours kill virtually all the fruit trees in the Valley. Many orchards are pulled and not replanted. United Fruit Growers’ Association shipments drop to 25% of previous year. 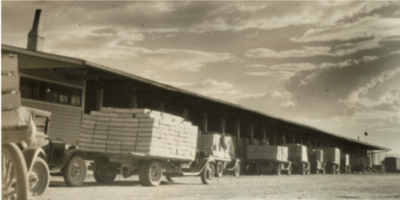 By 1966, UFGA shipments total only 58 refrigerated boxcars of fruit, down 95% from a decade earlier. Winger/GoBoy Mine in Rapid Creek closes. Palisade Library/former Bower Garage on 3rd St. demolished and replaced by Municipal Building. Diminishing fruit shipments mean by 1975, Denver and Rio Grande Railroad refrigerated box cars are no longer used to ship fruit. Mesa County rezones much of Palisade as R-3 (high density housing) to encourage development in response to the Oil Shale boom in Rifle. Wine grapes are introduced as an alternative to the devastating loss of fruit trees from the winter kill damage of the 1960s. 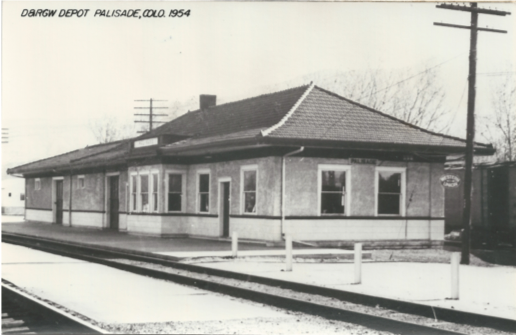 With no passenger train service, Palisade’s second depot is torn down. The Palisade Tribune publisher, Bill Lorenzen, writes articles noting Palisade has 850 people and 1 grouch. With the devastating winter kill in 1962-63 and depressed prices for peaches, Curtis Talley, the agriculture teacher at Palisade High School, and other orchardists Fred (Danny) Bracken, George Zimmerman, and Ralph Blatnik, replace their fruit orchards with 20 acres of grapes in 1973. Gerald Ivancie of Ivancie Winery in Denver encourages wine grape planting in Palisade. The 1973 plantings succeed. With diminished fruit shipments, the Mountain Lion Co-op and United Fruit Growers’ associations merge. The Mountain Lion platforms burn to the ground a few months later. The offices included Entomologist Max Sisson’s work with the Palisade Insectary. 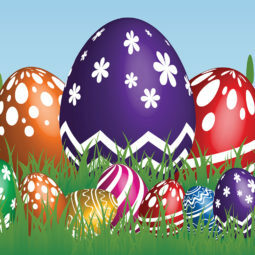 A popular tradition for Palisade residents every April is attending Blossom Sunday Dinner at the Orchard Mesa Community Center. 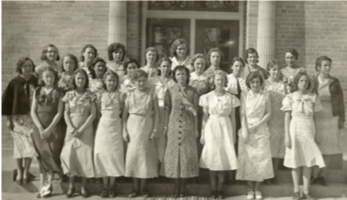 The women on East Orchard Mesa hold bake sales and fundraising events to build the “Club House” starting in the mid-1930s. The public was invited to the annual fundraising event until the last one in 1975. The Palisade Women’s Club project provides local artists an opportunity to have their paintings hung on the west wall of the Independent Lumber building across from the Post Office until the wall was torn down. Boxes of peaches on the United platform ready to be loaded into boxcars. The United Fruit Growers Association begins shipping peaches via refrigerated semi-trucks rather than refrigerated railroad box cars in 1975. 1910 High school building demolished in December. Co-op (Mountain Lion) and United Fruit Growers’ associations merge. Mountain Lion platforms burn to the ground in August, although the brick office is saved. Salinity Control Act (Public Law 93-320) passes. Refrigerated semi-trucks replace rail cars for shipping peaches and fruit from Palisade. Monitoring Stage One for Salinity Control begins and continues through 1984. The project is designed to reduce the amount of salts flowing into the Colorado River by lining canals and encouraging water saving irrigation methods. United Fruit Growers’ association platform west of Kluge Avenue burns January 9. Colorado Limited Winery Act in 1977 establishes a class of winery producing less than 100,000 gallons of wine per year and using at least fifty percent of Colorado grapes. Salinity environmental studies completed for stage one of the salinity project. 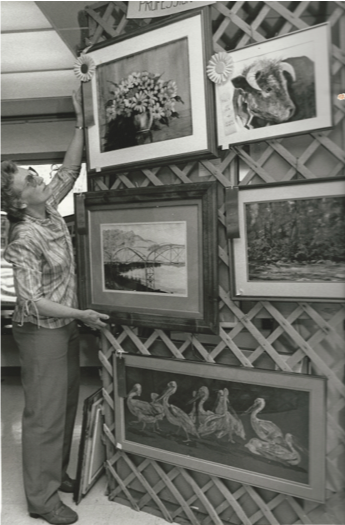 Palisade Art Lovers (PALS) is started by nine members. The first Art Show was held soon after, on December 15, 1980 at the Palisade Public Library which was located in the Municipal Building on East 3rd St.
Palisade’s agriculture economy continues to evolve. The oil shale boom, which siphons off rich, agricultural land for employee housing, finally bursts. Palisade families create the Mesa Land Trust to offer financial incentives for conservation easements to save the unique farmland at the east end of the Grand Valley. Fruit growers suffer another severe winter kill in 1989 which damages trees and newly planted wine-grape vines. Wineries open, bringing another reason to visit Palisade. 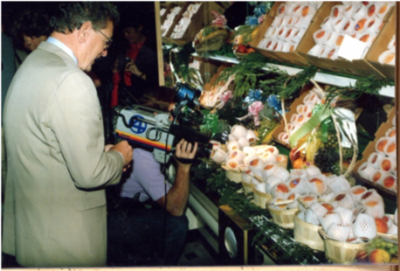 Colorado Governor Roy Romer was there being interviewed as the Denver Broncos football team was in London to play an exhibition game with the Los Angeles Rams. 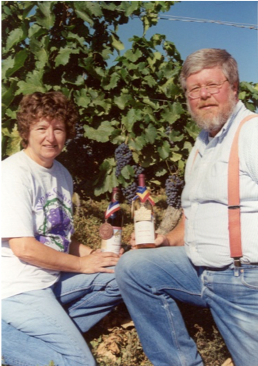 Mary and Parker Carlson began Carlson Vineyards in 1988. It was the second winery in Palisade. Mt. Garfield Middle School built on Highway 6 about two miles west of Palisade. Jim Sewald opens Palisade’s first winery, Colorado Mountain Vineyards. Mt. Garfield Middle School on Hwy 6 opens. Public law 95-569 amended Title II provisions to authorize Colorado River Salinity Control. Mary and Parker Carlson start their own winery. Severe winter damages fruit and wine grape crops. Doug Phillips and Eric Bruner who opened Plum Creek Cellars in Larkspur in 1984. move their winery to Palisade. 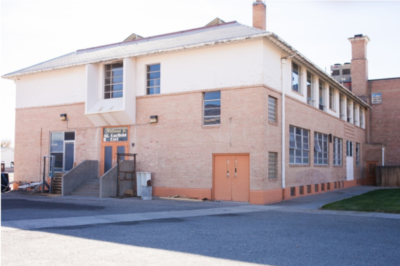 A group of parents successfully obtain special financing through the Underwood Amendment to build a new Palisade High School west of Palisade on G Road. The Chamber of Commerce and Town of Palisade successfully raise funds for a downtown improvement project which includes planting trees, replacing curb sidewalks with ADA compliant sloping sidewalks, new street lights and an information kiosk and gazebo. The blinking traffic light at 3rd and Main Streets is replaced by stop signs. Though fruit growing continues, more grapes are planted and more wineries open, which increases tourism. The 1925 Palisade High School building becomes Mt. Garfield East. The building later becomes the Town’s property. After the new high school on G Road west of Palisade opens in 1992, this building is used for other classes, including for sixth graders, and as an alternative high school. It is later purchased by the Town of Palisade. The new Palisade High School opens on G Road, Highway 6, west of Palisade. Riverbend Park opens, located between former CCC & Migrant Labor Camps. Peach Festivals have been held here since 2003. Last operating coal mine, Powderhorn/Roadside Mine closes in December. Palisade Library moves from Municipal Building to an annex of the 1925 Palisade High School building as requested by the Town. 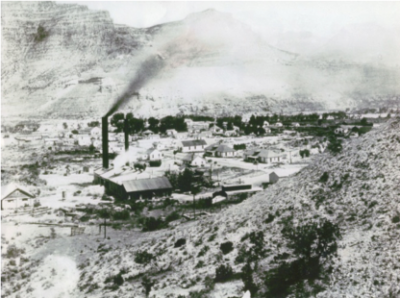 Town of Palisade celebrates its Centennial. Town creates a plaza out of the parking lot on Main Street, once part of the site of Jordan’s Inn which burned in 1915. Palisade’s newspaper of record, The Palisade Tribune, is sold to the publishers of The Daily Sentinel in 2012. 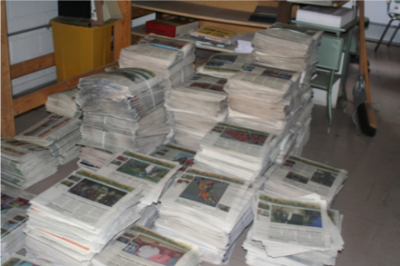 Two years later, in March 2014, the Tribune ceases to be printed. The community suffers from having no local news source. Palisade Historical Society negotiates for the archival newspapers in the building and then fundraises to get as many issues of the newspaper, beginning with the June 6, 1903 issue, digitized and available for research on the Colorado Historic Newspaper Collection website. Palisade has the only Medical marijuana outlet in Mesa County and voters approve retail marijuana stores in the November 2016 election. In addition to expanding into retail by the Medical Marijuana store, two more retail stores are authorized to sell marijuana by the Town Board. 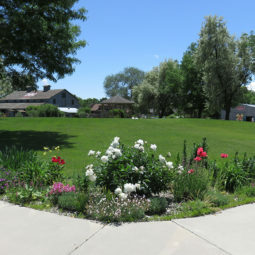 Wineries continue to be a big attraction, though record peach crops continue to make Palisade a destination for tourists and locals. New crops grown in Palisade include lavender and hops. Nick is a 4th grade student at Denver Public School Amos Steck Elementary who founded Colorado for the Palisade Peach in an unsuccessful attempt to designate Palisade Peaches as the state fruit. Stacks of newspapers in The Palisade Tribune office are sorted and placed into archival boxes. The community is devastated when The Palisade Tribune, the newspaper of record since June 6, 1903, ceased publishing March 13, 2014. Palisade Historical Society volunteers sifted through the building’s contents to find and preserve original copies of the newspaper for reference and future digitizing. By August 2017, the Historical Society raised funds to get 1,707 issues digitized–over half the issues ever published from 1903 to 1966–added to the Colorado Historic Newspaper Database for online research. Palisade Historical Society incorporates as a non-profit organization in March. Palisade Library relocates to former Independent Lumber Company office building on Main Street. 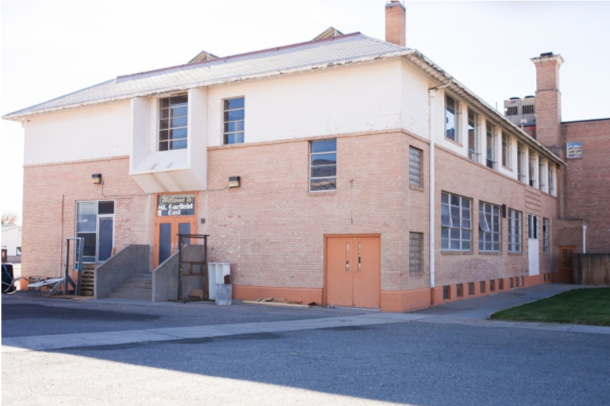 Palisade Fire Department relocates to remodeled annex of the 1925 school on 8th Street. Wineries are the biggest tourist attraction in the Grand Valley. Palisade has 19 of the 25 wineries in the area. The Palisade Tribune ceases publishing March 13 by the owners of The Daily Sentinel. Palisade Historical Society volunteers work for months to save remaining original papers and begin lengthy process to digitize and make papers searchable and on line. Legislation introduced to make Palisade Peaches official State Fruit fails to make it out of committee, due to pressure from Eastern Slope cantaloupe growers. 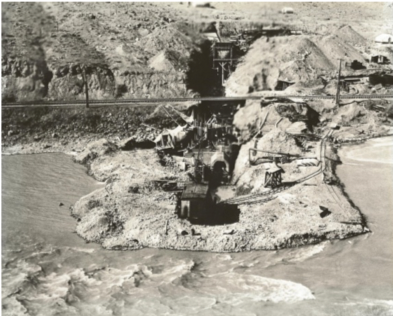 Palisade Historical Society celebrates 100th birthday of the dedication of the Grand River Diversion Dam on June 27 to call attention to the vital roll irrigation plays to our life in the Grand Valley. A crowd of 500 enjoys speeches, including from Congressman Scott Tipton, Bill Fitzgerald, great grand nephew of Wayne N. Aspinall, and others. Three birthday cakes were cut by Dorothy Carver Hines, who grew up at the Roller Dam, as her father was caretaker for 33 of the Dam’s 100 years. There was also a “Dam art show” with 43 “roller dam” centric entries, documentaries, videos, and information booths. Music throughout the day-long celebration featured Jeanie Thomas, Bookcliff Barbershop Chorus, and Way Down Yonder bluegrass band.